THE RAISED ACCESS FLOORING COMPANYAccess Flooring made easy. . .
Raised Access Flooring, Floor Installation, Maintenance and Supply Only Services. The Raised Access Flooring Company have been supplying and installing raised access flooring systems for over 30 years. Previous projects and applications have included commercial offices, dealing rooms, computer suites, datacentres, retail and leisure. We recognise that today’s buildings need to be sufficiently flexible to accommodate tomorrow’s needs. 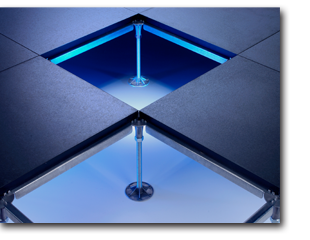 The incorporation of a well-constructed and perfectly installed raised floor system provides a safe but easily accessible environment in which to house critical services such as power, voice, data, heating, ventilation and cooling systems. As leading specialists based in central London our comprehensive experience is the key to a successful and problem free 'flooring solution' for all projects. We supply and install all raised access flooring systems and finishes throughout the UK. Our qualified team will assist from the initial concept and costing stage through to the final completion for all projects no matter how small or complex. We have 'in house' drawing facilities which enable us to operate electronically for all documents in nbs specification, drawing transmittal and detailed design. A clear strength of our team is the ability to react quickly and undertake site surveys completely free of charge and without obligation. Our experienced operatives are all qualified to the requirements of the Construction Skills Certification Scheme (CSCS cards) ensuring our duties and responsibilities to health and safety are vital. The Raised Access Flooring Company are independent and are not bound to any one product, we are supply chain partners with many of the leading UK suppliers and manufacturers which ensures a competitive, economical and practical solution for every project. Access floors create energy savings, less waste and reduced costs. With air distribution managed under the access flooring, your facilities have the ability to deliver improved personal thermal comfort control, better acoustics, enhanced ventilation effectiveness and improved indoor air quality. The unique design of certain panels minimises air leakage, reducing heat loss when the underfloor void is used as an air plenum – the ideal choice for low energy buildings. With underfloor distribution of power, voice, cabling and HVAC services, access floors enable a cost effective integration of building components including structure, lighting, furniture and wall systems. This imparts a great deal of flexibility to infrastructure systems so that you can respond quickly and economically to organisational changes, expansion due to growth, adapting to new technologies and integrating new communication tools. The Raised Access Flooring Company invests considerable time in ensuring our supply chain is efficient, cost effective and responsible. Through our network of carefully selected suppliers and manufacturers, predominantly from the UK, we are able to keep costs low without compromising on quality. A high proportion of raw materials are sourced from within the UK, the high density particle board core in panels uses 90% recycled material which together with a quantity of recycled steel helps achieve our objective of using natural resources within sustainable limits. Our main manufacturer uses all waste chipboard and chipboard dust in their biomass burner to heat the factory thus purchasing virtually no fossil fuel for heating. We are committed to responsible sourcing and use renewable, sustainable materials wherever possible. We have a pro-active approach and our policies are constantly reviewed, monitored and communicated. Durable and providing long-term service access floors are easy to install and maintain. Our environmental policy is communicated to all members of our organisation, so that they are fully aware of our key objectives, and of their roles and responsibilities in achieving them. Our workers are provided with adequate information regarding environmental aspects and impacts associated with their particular roles and responsibilities.